Every once in a great while a new product comes out that seems a little silly, but you know it just makes sense; Final Cut is one of those products. It is as simple as a sandpaper disk attached to the side of a saw blade. The Final Cut works on the theory of using lesser teeth that would usually leave a rougher cut, and let the Abrasive Disk, which is wider then the kerf of the blade, do the sanding and cleaning. When purchasing the Final Cut, you have two choices. You can buy the 10” blade with the abrasive disks attached (with more sizes coming in the future), or you can buy the Abrasive Disk to fit your existing 8-1/2” to 12” blade. You can also use them on smaller blades, but you would have to cut them to size. The 10” blade costs $75, and a four pack of disks costs between $23 and $27, with a ten pack running a little cheaper per disk. The setup to attach the abrasive disks is quite simple. All you need to do is wipe down the saw blade on both sides with some lacquer thinner to remove all the dirt or residue. I also went ahead and removed all the ink on the blade to make sure the disks really stuck, and made sure not to get my hand oils on the blade. My co-worker and I noticed that the 11-1/2” disks that fit a 12” blade were a little too big, and would overlap the teeth. We both had different saw blades, and they both needed to be cut down a little. We took a diameter measurement from tooth to tooth, and came up with the sizes we needed. To get a nice circle, I took out my scribes, and drew a line all the way around. We then used some laminate shears to cut the new sizes. I think the new sizes were 11-1/4” and 11-1/8”. After that, it was as simple as pilling and sticking it to the blade, using the backer to help press the disk into place, as suggested by Final Cut. Nothing really too scientific, we simply used the disks attached to blade for normal everyday baseboard installation over the period of a few weeks, cutting both alder, and oak 7-1/4” base. The first thing you will notice is a really smooth cut, but the big plus is the elimination of the little wood fuzzies that are left over on a normal blade cut. You really notice the fuzzies on hard woods like oak, where at the very end of the cut, the wood is pushed away from the blade instead of being cut, but not with the Final Cut. The Final Cut also eliminates burning and kerf marks; something that is not a huge problem for mitered cut, because they are hidden anyways, but a huge advantage for back beveled or straight cut terminations. I did have one problem with my saw, and the Final Cut disks, and I am not sure exactly what happed or why. The cuts started to smoke, and the saw was having a hard time cutting, then the disk got gummed up. I don’t know if the was because the saw was underpowered (10 year old saw), and just had heat build up, or maybe some sap gummed up the abrasive paper. If I would have thought about it at the time, I would have used my sandpaper cleaner to clean the disks and try again, but I didn’t, and ended up removing the final cut. The other saw with the Final Cut disks had zero problems for the entire 3 weeks, and is still going strong, so I don’t know what to make of it. For the 10” blade, we did some testing on the table saw. On the table saw you really notice a change in just about everything. The first thing you notice, is how much quieter the cutting is, I guess this is because the abrasive prevents the wood and the blade from making additional contact. Say bye-bye to squealing saws. You will also notice that just feeding your material through the saw is smoother, and saw binding is almost completely eliminated. This is because any wood that tries to bind, or hold up your cut, instantly gets removed by the abrasive disks. So, not only are your cuts better, and you have eliminated kerf marks, you also have a much safer saw. Overall the Final Cut is a great product. I had the one that gummed up on me, but at the time, I really should have taken the time to figure out why. Other then that, the other Abrasive Disk, and the 10” saw blade held up great. When I first heard about the Final Cut Disks, I thought there was no way they would be able to stay on the blade for long periods of time. They have far outlasted what I expected. 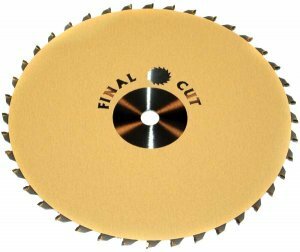 I didn’t really notice a difference between the Final Cut Saw Blade, and a regular saw blade with the Abrasive Disks attached, so the final choice is up to you, on which you want to buy, but I do recommend you give Final Cut a try. Also I would like to see the price come down a little. Hopfully if the Final Cut does really well, they will be able to lower the price. The price of the Saw blade is also higher then I would expect from a 40 tooth 10"
Final Cut is working on a centering tool to make centering your Final Cut disks a snap. It will fit into a 5/8" and 1" arbor and have a 2-7/16" hole for the disks. They have also informed me that the 11-1/2" disk will be replaced with a 11-1/4" disk to eliminate the need for trimming.